Hawks guard Shelvin Mack slips past Magic point guard E'Twaun Moore (55) during a December game in Orlando. TIME: Wednesday at 7 p.m. The Atlanta Hawks have looked like a potential tough out in the playoffs while taking impressive wins over Houston, Indiana and Miami this month. There’s only one catch: All those wins came in Atlanta. The Hawks, who play at Orlando on Wednesday, must improve their dismal 6-13 road record if they are to be considered as a true postseason contender. The Hawks, who are third in the Eastern Conference, snapped a nine-game losing streak against the Heat on Monday night. That win gave guard DeMarre Carroll, one of several newcomers to the Hawks, more reason to believe the road wins will come. Entering Tuesday’s games, Phoenix was the NBA’s only other team to have an overall winning record and a losing mark (9-11) on the road. The Hawks don’t feel they have to make huge adjustments to have success on the road. ”There is no difference,” in playing on the road, 14-year veteran Elton Brand said with a laugh following Tuesday’s practice. Brand then laughed again. He knows perception can be difficult to overcome, even for a team with a 15-6 home record, including the recent impressive string of wins against such playoff-bound teams as the Eastern Conference-leading Pacers and Heat. Brand, Carroll, Paul Millsap and Pero Antic are among the veterans in their first seasons in Atlanta. 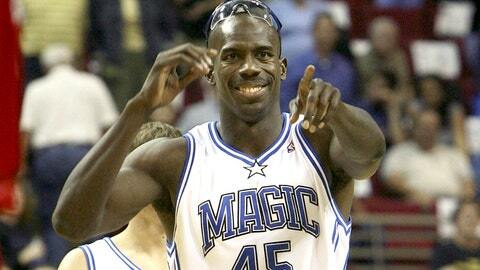 The Orlando Magic will honor former star forward Bo Outlaw during Friday's game. Brand and Antic have earned more minutes at center to help the Hawks remain competitive after losing All-Star Al Horford to a season-ending injury last month. Horford was the team’s leading scorer and rebounder when he tore his right pectoral muscle on Dec. 26. Antic set a career high with 17 points in Monday night’s 121-114 win over Miami. First-year coach Mike Budenholzer said Tuesday the Hawks need to show more ”attention to detail” and play with improved mental sharpness on the road. The Hawks have played well in some of their road losses, including a 102-100 loss at San Antonio on Dec. 2 and an overtime loss at Miami on Dec. 23. 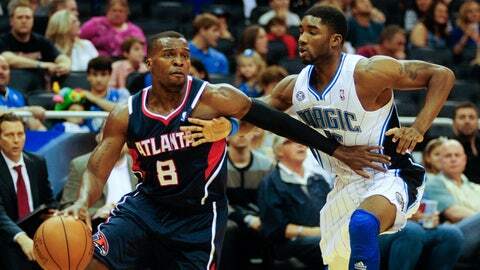 Atlanta has split two games with the Magic, winning at home on Nov. 9 and losing 109-102 at Orlando on Dec. 29. Atlanta (21-19) played one of its best games Monday against Miami. The Hawks showed the mental toughness Budenholzer has sought as they made 25 of 27 free throws, shot 51.9 percent from the field and committed only 13 turnovers. ”On the road we seem to have a lot of slippage as a team in that area – turnovers, lack of execution,” Brand said. Budenholzer said he’s looking for more consistent play from his team as the Hawks play three of their next four games on the road. ”Obviously we’ve played well at home and I think the energy and the effort, if it’s higher at home, I think the home court, your fans and all of that may feed into that,” Budenholzer said. ”But our approach is we want to be the same at home and on the road. Obviously the wins and losses aren’t showing that we’re the same on the road as we are at home. … I think our group is getting there. I think in all ways, shapes and forms we can just continue to get mentally tougher. The Magic (11-31) ended a 10-game slide with a 93-91 win over Boston on Sunday before reverting to their losing ways Tuesday in a 101-90 defeat at Brooklyn. Reserve Kyle O’Quinn had 15 points and eight rebounds, and E’Twaun Moore scored 13 for Orlando, which trailed 46-42 at the break but scored only 14 points in the third quarter.